This year’s BASRA fundraiser has evolved from ball to extravaganza! 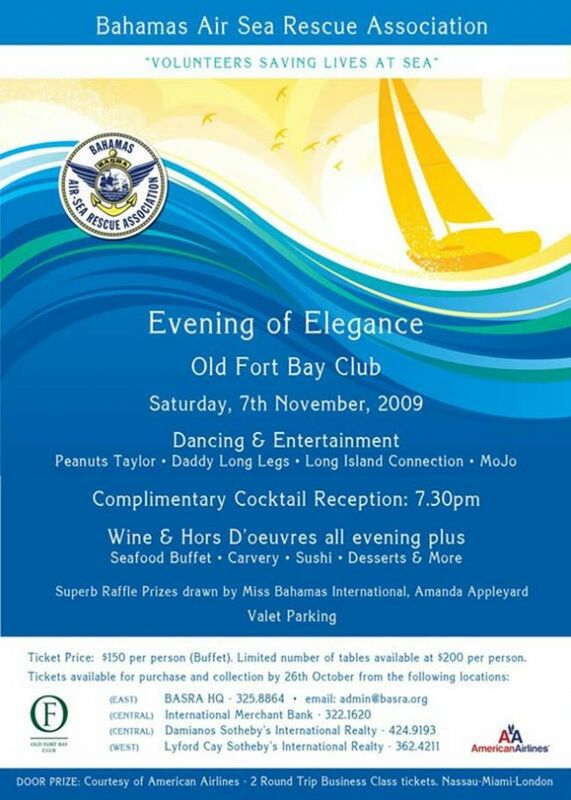 Nassau, The Bahamas - Bahamas Air Sea Rescue Association’s “Evening of Elegance” on November 7th will be hosted at the Old Fort Bay Club, and will feature an incredible line up of entertainment featuring Peanuts Taylor, Daddy Long Legs, MoJo from Elvina’s in Gregory Town Eleuthera, and The Long Island Connection. A wonderful door prize of two round trip business class tickets to London courtesy of American Airlines, and a bounty of superb raffle prizes to be drawn by Miss Bahamas International, Amanda Appleyard. Food will be plentiful and varied, featuring a Sushi Bar by the pool, a carvery showcasing local delicacies such as Andros roast pork loin with apple chutney and tropical fruit salsa, a seafood buffet, and a dessert selection that will make you want to stay late and dance more! Please join us on November 7th at 7.30pm for mixing, mingling, dancing and dining under the stars in this beautiful Club! Let’s support BASRA! BASRA HQ: 242 325 8864, International Merchant Bank (Down town): 322 1620, Damianos Sotheby's International Realty , Shirley St: 424 9193 and at Lyford Cay Sotheby’s International Realty: 3624211.